Many people who are renting are not insuring their belongings, according to an article published by Florida Realtors only 43% of renters in 2006 had insurance to cover their belongings. The landlords insurance for the property does not cover belongings of the tenant and also it does not cover accidents to guests. Rental Insurance can be as little as a cup of Starbucks coffee a week, you might be able to get discounts if you add rental insurance to a policy you already have, for example bundle it with your auto insurance, also there may be discounts for having smoke alarms, fire extinguisher and other safety items in the unit. In the above mentioned article, the average cost for rental insurance in 2008 was $176, which comes out to be $3.39 per week or $14.67 per month. The web-site Know Your Stuff can help you take inventory of your belongings and guide you through the steps to get the right coverage for you. Your belongings may be worth more than you think, it took years to amass all of the belongings and frequently people underestimate how much their belongings are worth. Squatter claims to be "Acting As Part Of Obama's Plan"
In Apopka, Florida a man moved into a home in foreclosure with his expecting wife. The problem is that this home is not his to move into. The kicker is that he told the deputies that he was "acting as part of President Obama's plan to recapture and revitalize abandoned properties." The man has been arrested and if convicted will serve up to 30 years. Foreclosures do present problems in neighborhoods. If you are aware of suspicious activity, please call the police immediately. Most common problems with foreclosures sitting vacant include: Air conditioners being stolen, property is vandalized and squatters moving into a vacant home. I frequently hear people complaining about home information being outdated on web-sites such as Zillow and HotPads. A letter to the editor was sent to the Florida Realtors complaining about this issue "Home info on Zillow.com is outdated". For Realtors this is a complaint we hear all the time. Zillow touts that they have the "Real estate Edge" and HotPads claims that they are "the place to find your place". Zillow produces estimated values for homes, I have seen these estimates go far outside of the ballpark with these estimated values. Homes are different, your home might be in much better condition than your neighbors. How is Zillow going to know that without looking at your property? If you really are considering selling your property and want to know the value of it, talk to a Realtor. Most Realtors will make a Comparative Market Analysis for you for free. We do. Hotpads syndicate listings all over the web to their site and in my experience, their rental listings are often already rented when people start to call to ask about the property. Real estate is local, talk to your local Realtor to buy or sell a home. **Edit on March 29th 8:21pm** Zillow has posted a comment in response to this blog, please click on "View Comments" to read the response. The US Census released information about the 2010 Census a few days ago. It has been interesting watching the following coverage on the news and online articles following that release. According to the US Census Bureau, 17.45% of Florida homes are vacant. This is the raw data for from the Census that has been interpreted to mean that 18% of homes are currently vacant and in distress. You can find the table on the US Census web-site. The media has splashed this new report as these vacancies being the result of foreclosures and abandoned properties. Although a portion of the number represented here is the result of foreclosures, a large percentage of these vacancies are due to the high number of vacation properties that Florida has. Florida is known for attracting snowbirds that come here for vacationing and their second homes. CNN and the Orlando Sentinel have reported that there is nearly a 20% vacancy rate in the state and only focus on the foreclosure aspect. In 2000, the vacancy rate was 10%, although that number is high, when comparing it to the current vacancy rate, you will see that it is not all foreclosures and distressed properties that are vacant. The U.S. Census Bureau defines vacant as meaning "no one is living in it at the time of the interview, unless its occupants are only temporarily absent" or "entirely occupied by persons who have a usual residence elsewhere." This means that snowbirds are not counted towards occupied homes, also if you've ever been to Florida, you will have heard about timeshares, we have a plethora of timeshares in Florida. The vacant homes are up by 7.45% since 2000. Which if we are to assume that the same percentage of snowbirds occupy Florida homes, that means we have about 7 to 8 out of every 100 homes that are vacant as a result of foreclosures. If you are to rely on CNN for your foreclosure statistics, then that would be almost 1 in 5 homes vacant due to foreclosures. That is a drastic over exaggeration of the current Real estate market. The reality is that Home buying is still an investment. It is an investment you not only make in yourself and your own wealth building, but also an investment you make in your family, community and personal well being. The recent economic slump and housing downfall have lead some to believe that the American Dream is no longer a dream, but a Nightmare. It is not hard to see how they have come to see it that way with the news constantly talking about foreclosures and short sales. Your home buying experience should be a pleasant one, but so should your home owning experience. By following these couple of sound principles when purchasing your home, you will be in a better position to own your home for the long term. 1. Buy the dream home you can afford. When buying a home, it is easy to get carried away with all the extras. When you are looking for a home, seperate your needs from your wants. Your needs might be 3 bedrooms and an office, but your wants might be a swimming pool, upgraded kitchen and an extra bedroom for guests. Work with your Realtor to get as much of your wants into the home that you need, but you also need to make sure that you can afford the payments. 2. When you buy, make it a long term investment. 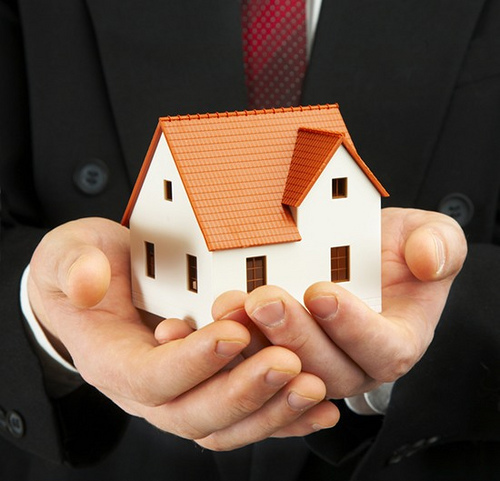 Real estate historically has shown to be a great investment, over the decades property value has increased 6% annually. During the housing bubble, that might have been 6% in a month, but those prices were not sustainable. It has never been as affordable as now to buy, with both low prices and low interest rates. When you buy and sell Real Estate, there is a cost associated with that and if you are only buying for the short term, it does not give you much of a return. 3. Fixed, affordable payments. When finding the right financing for your mortgage, fixed payments that you can afford are best for most buyers. Then if your income goes up, you will have more money to use for other things, maybe even upgrade the kitchen you really wanted. As our communitites grow, a need for more efficient transportation grows as well. One proposed solution in the Central Florida area is the SunRail system, which would link Poinciana to Deland going through Downtown Orlando. The proposed route would have stops in Seminole County at Longwood, Lake Mary and Altamonte Springs. Currently the highspeed rail system is under review by Governor Rick Scott who has placed the project on hold until this summer. More in this Orlando Sentinel article "Scuttling SunRail would cost millions." Citizens still hope for the SunRail system to lessen traffic and congestion as well as to be more economical and environmentally friendly. The Florida Department of Transportation (FDOT), in cooperation with the federal government and local officials in Orange, Seminole, Volusia and Osceola counties and the city of Orlando, is advancing SunRail, a commuter rail transit project that will run along a 61-mile stretch of existing rail freight tracks in the four-county area. The 31-mile first phase of SunRail will serve 12 stations, linking DeBary to Orlando. Phase II will serve 5 additional stations, north to DeLand and south to Poinciana. Service will begin in 2013 for Phase I and 2015 Phase II. More than 113,000 construction jobs will be created within one-half mile of station stops as the area develops/redevelops. More than 13,000 direct SunRail construction and operations jobs will be created, most of them almost immediately, generating more than $350 M in household earnings. 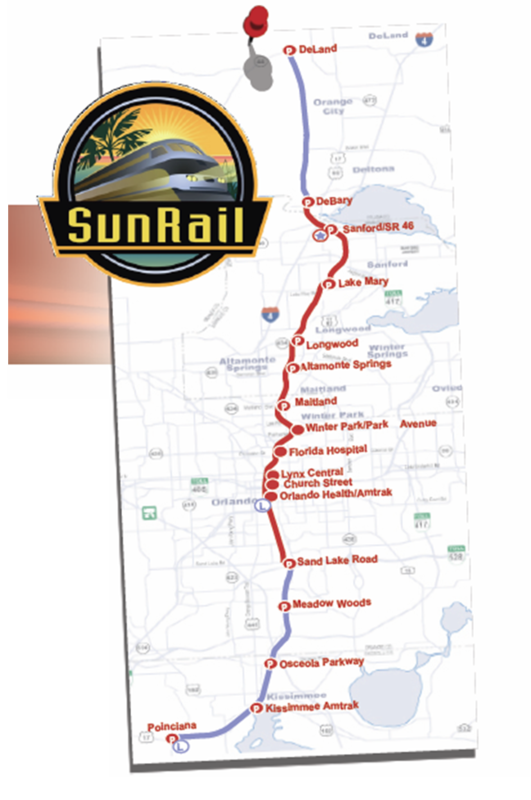 SunRail will spur development and redevelopment along rail lines and at station stops. Over $2 B in economic development has occurred along the Rail Line in Charlotte over the past few years. Within 20 years, property owners can expect an increase of almost nine times their current value for property values within one-half mile of station stops. 4.6 B dollars in earnings will be generated for the construction sector over the next 20 years. Secondary economic impacts of more than $2.5 B will result from workers living and spending within the area. SunRail will result in savings for both highway and transit users in terms of reduced travel and commute times and reduced fuel costs. Existing LYNX transit routes will be adjusted to connect to serve the SunRail system. According to the American Public Transportation Association, a typical state or local government could realize a 4 to 16 % gain in revenue due to the increases in income and employment by investments in transit. 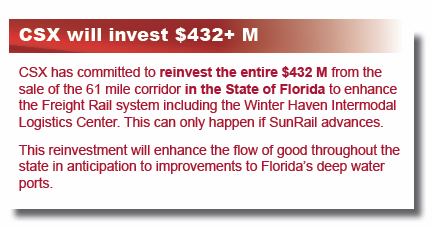 SunRail will result in an infusion of more than $8.8 B over the next 30 years into Florida's economy. Statistics are provided courtesy of Central Florida Partnership and Florida Department of Transportation. Ditto isn't your average Longwood, FL resident. 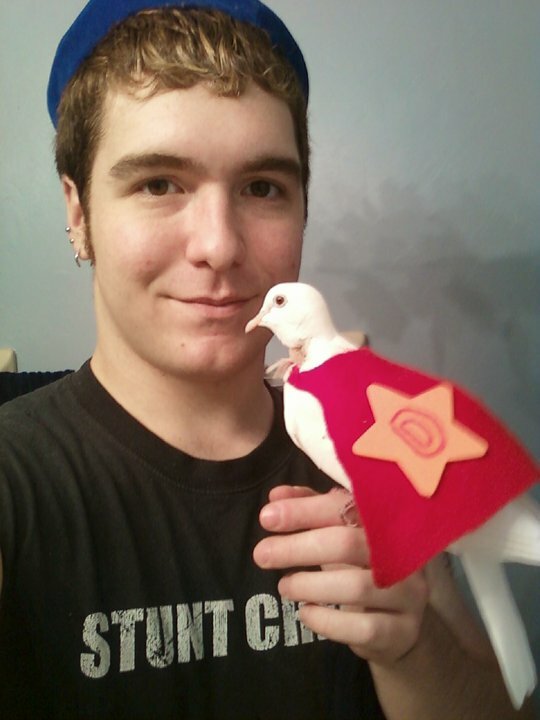 Ditto is an 8 year old white dove. Ditto's owner is Ian Reents who resides with Ditto and his feline companions Mirage, Princess and Magic. Ditto was a professional magician's dove for 3 years, after which Ditto had to retire. Ditto enjoyed entertaining children by disappearing and reappearing from a magical hat. Currently Ditto enjoyes relaxing in the shower and cooing in his cage during the day. Ditto is very good with children and still enjoys entertaining children, although his days of magic tricks are over. This video is of Ditto taking a bath. The current pace of sales translates into 6.47 months of supply; January 2010 recorded 8.14 months of supply. With 8.14 months of supply we are currently in a Buyers Market. This number is determined by examining at the rate of which homes are selling today, how many months would it take for all homes currently available for sale to be sold if there were no more homes to enter the market. First-time homebuyer affordability in February decreased to 195.23 percent since January 2011. For further information on affordability of the current Real estate market, follow the link to find out about our monthly Home Buyer Seminar and attend a no cost, no obligation educational event. What’s going on with the Septic Tank? When you buy a home that comes with a septic tank that also means that you have the added responsibility of taking care of that septic tank. Whether you like it or not, every few years that septic tank will have to be pumped out. There is a reason why you see so many ads on TV about septic companies and products to take care of it. All too often, homeowners will postpone, procrastinate or just plain ole forget to have the septic system checked and pumped out. The septic system something that is so easy to forget about, it sits there, out of sight, out of mind, taking your unwanted waste and processing it. It sits in the yard under a tuft of grass. So how do you make sure that you don’t run into problems with it? 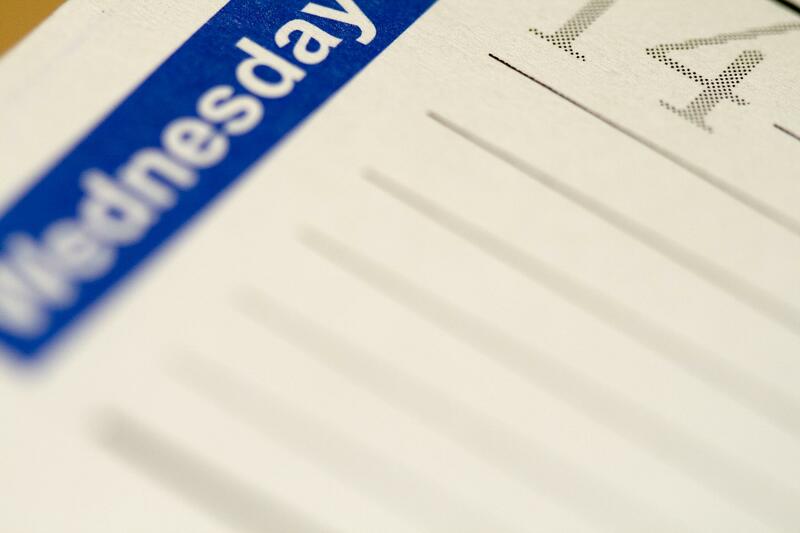 My suggestion is to set up a schedule on a calendar, most cell phones now a days have one, you might also have one through Outlook, Gmail or any calendar that you use. Consult your local septic company about how often your tank needs to be pumped, most will come out for free to inspect it and give you a quote for what needs to be done, so ask them while they are there how often it needs to be maintained and put that into your calendar. Usually it ranges from 2 to 5 years, this depends on how large your septic tank is, how many people are using it and what goes into the septic tank for example if you have a garbage disposal all the food you put into it will go into the tank. Use a septic tank treatment and a cleaner every so often to keep the septic tank flowing and to avoid clogs. Garbage disposals add about 50% of the solids in your septic tank and frequently lead to malfunctions, you should never put any oils or grease in the garbage disposal and if you want to be environmentally friendly, you can start composting instead of using the garbage disposal. With proper care your septic tank will cost you less in the long term than using city sewer, however, when your septic tank is neglected, it will get very costly. If your septic tank starts backing up and overflowing it can run you thousands of dollars to clean it out and pump it. Seminole County Health Department has a comprehensive list of Do's and Don't for Septic Systems. By Lake Monroe in Sanford is the Central Florida Zoo. This zoo is a fun way to get out of the house and spend some time with family, friends and loved ones. The Central Florida Zoo has added several attractions other than the various animals, reptiles and birds that you will find at most zoo's. These attractions are The Wharton-Smith Tropical Splash Grounds, ZOOm Air Adventur Park and Battlefield Live Orlando Laser Tag. You will also find the little Florida Coastline Railroad, a carousel, a petting zoo area, keeper chats and educational classes at the zoo. One thing you do not want to miss out is the Butterfly garden. Yes, you read that right, the butterfly garden. It does not take long to walk through it, but it is an experience that will relax you and stun you with beauty. When you walk through the garden, you will see a variety of beautiful flowers and foliage, then you will smell the different flowers as you walk. Around the flowers and foliage fly many different species of butterflies, of different shapes and colors. It is a very neat experience. Enjoy the simple things of life. For children, the petting zoo, named Animal Adventure Children Zoo, inside of the Central Florida Zoo is a must. Inside the gift shop you can make a donation of a dollar to get a cup of animal food and then go pet and feed the animals they have there, including, Zebu, Llama, Barbados Sheep, Boer Goats and Domestic Turkey. We suggest taking a trip to The Central Florida Zoo & Botanical Gardens in Seminole County and follow it up with a cruise on the St. John's River with The Rivership Romance.